You will earn 21,770 Reward Points. Earn 1 reward point for every 1 dollar spent. Modular Cabinet Base with Hinged Door. All Controls are serviceable from the front. Solid State Controls operate water level and safety functions. Standard Voltage for Controls: 115 volts, 60 Hz, single phase. Cooking Capacity for up to six 12˝ x 20˝ x 21 ⁄2˝ deep Cafeteria Pans. Automatic Water Level Control System with Low Water Power Cut-off Circuit. Pressureless cooking with forced convection steam, permitting doors to be opened while cooking continues. Automatic Generator Drain at shutdown: Contains a “Water Jet” Spray Rinse Cleaning Cycle to keep drain clear. Steam generator equipped with High Limit Pressure Safety Switch, 15 psi Safety Valve, and Steam Generator Pressure Gauge. Steam Coil Generator: Automatic Water Fill on start up. Minimum 35 psi incoming steam pressure required with a 3 ⁄4˝ steam line. Each compartment is equipped with a 60 minute mechanical timer, separate bypass switch for constant steaming and a cold water condenser for superior cooking results. Exclusive “Cool to the Touch” Compartment Door Design: Free floating inner door with reversible door gasket provides an air tight seal. Stainless Steel Slam/Latch mechanism provides greater reliability. Exclusive Steam Cooking Distribution System: The exclusive Convection Jets produce a high velocity convection steam without fans. Curved Corner design in cooking compartment distributes heat evenly and is easy to keep clean. Creased top & bottom enhance drainage. Cold Water Condenser for each compartment maintains a dry steam. Fully insulated cooking compartment for thermal efficiency. Removable Stainless Steel Slide Racks for easy cleaning. Two Compartments, CLEVELAND Convection Steamer, Model 24- CSM, Steam Coil Steam Generator, 115 volts, single phase. Solid State Controls operate timing, water level and safety functions. Steam Generator with Automatic Water Fill on start-up and Automatic Blowdown with additional Manual Drain Valve. For each cooking compartment: 60 minute Mechanical Timer, Manual Operation Mode and Cold Water Condenser. 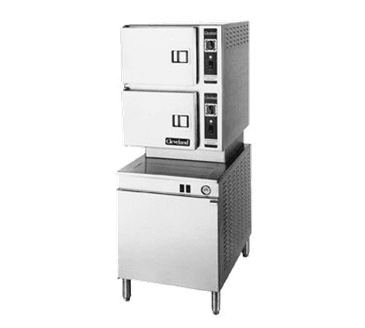 Type 304 Stainless Steel cooking compartment.